Chrichton's World: Review The Mummy (1999): Yep, it's a classic alright! Review The Mummy (1999): Yep, it's a classic alright! 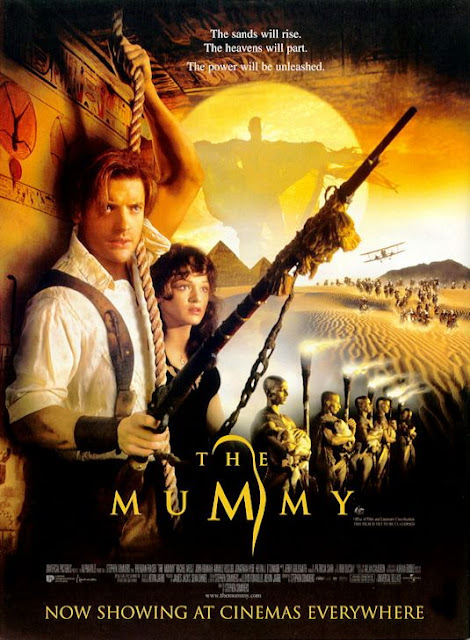 The Mummy is a movie I have seen several times in my lifetime and it is one that despite that still manages to entertain in the same spots it did the first time. Even knowing about all of the twists and turns the film remains a compelling and fun spectacle. I was surprised to find out how in places the film even succeeds in building up genuine tension and terror. But make no mistake it's the action that is the main draw and even after 18 years it is incredibly exciting. And while there is a lot of CGI effects in this film it never loses credibility. Perhaps because the actors do make it appear the dangers are real. Ít's also because of the fact that director Stephen Sommers very wisely so, has restrained himself from going overboard and focus on the basics like in that Indiana Jones franchise. Speaking of which. The Mummy feels very much like the Indiana Jones films. Most events are meant to be serious and dramatic but with a very healthy dose of humour mixed into it that gives the audience the much needed comic relief. John Hanna, Kevin J. O'Connor and Omid Djalili are the ones who deliver this throughout the film and it is one of the main reasons The Mummy is a lot of fun. Then you have Brendan Fraser and Oded Fehr. Both handsome and charming who are the dedicated heroes bailing out whoever need to be rescued. But wait that's not all. Rachel Weisz is the nerdy, charming and beautiful librarian who is their equal in every way and will not hesitate to do what it takes to achieve their goals. She is far from the usual and typical damsel in distress. Big baddie Imhotep played by Arnold Vosloo was brilliant also. Vosloo was clearly enjoying his role as the complex villain who has a purpose most of us can relate to. LOVE! The Mummy is old school adventure fun that does more right than wrong. Not that you are given time to notice the flaws since the film does move from event to event quite quickly. So do give this a watch. You won't regret it.